SPW040340 SCOTLAND (1932). 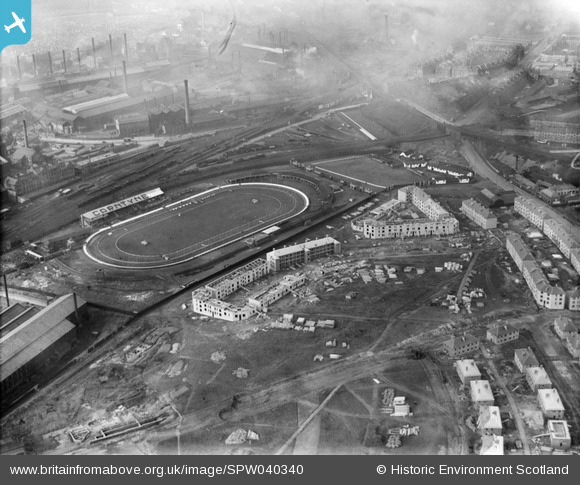 Carntyne Greyhound Racecourse, Myreside Street, Glasgow. An oblique aerial photograph taken facing west. Title [SPW040340] Carntyne Greyhound Racecourse, Myreside Street, Glasgow. An oblique aerial photograph taken facing west. View looking west from platform of Parkhead Station...long gone. Shettleston Road Employment Exchange, this building was awarded Category 'B' listing in 1992.
my grandmothers house with new build in progress 82 clerwood st carntyne glasgow scotland.